Why do the kings, queens and jacks look the way they do? Early European card makers had a cast of 12 characters to depict. Their tools were crude ones and their 'canvas' small; the prints of the cards were taken from woodblocks cut in relief and then hand-coloured or coloured via stencils. The woodblocks used were cut from planks (i.e. with the grain of the wood) and could not use the very fine lines that wood engraving did later (being made from woodblocks cut across the grain of the wood). The 12 courts of the French designs are all shown standing; their designers did the best they could by making each of them strike different poses (some head-on, some looking to one side, and some looking back with their head over their shoulder) and wear different costumes and carry different objects. It was important to the game-player that he could tell at a glance exactly which court he was looking at. The English (i.e. International) pattern derives originally from designs produced in Rouen (in France) before 1516. These show entirely credible and well-executed pictures of elegant persons wearing the typical elaborate court costumes of the period. In fact, the jack of spades and the king of diamonds are depicted as seen from the rear, with their heads turned back over the shoulder so that they are seen in profile. The same was also true of the jack of hearts. These designs, like others, were soon disfigured by uninformed and unskilled copying by block makers, particularly by incompetent English artisans, who produced the grotesque distortions from which our modern cards are ultimately descended. Only pictures can really show how the distortion of the designs took effect over time. You should now click on this link to display each of the courts over time in a separate window, while refering to the description below. column 1 shows images from a book showing cards of around 1567 made by the Rouen card maker Pierre Maréchal. This is the design which became the English pattern. This pack is missing the jack of diamonds and jack of hearts; others of a similar period have been substituted. column 2 shows images from a book showing cards of around 1750 made by the English maker Bamford. Two hundred years of bad copying of the design have left its mark. column 3 shows cards made around 1815; these are a copy of a Hunt pack—a fake made in Belgium to evade the high tax due to the English crown at the time. They show the English design at its worst point. column 4 shows modern cards. The cards used show the manufacturer Carta Mundi's standard design and are taken from a double pack entitled "What's Wrong Playing Cards?" produced by Dr. J.R. Block and Dr. Harold E. Yuker. Further examples of early English playing-cards can be seen at the World of Cards website. Most striking is that the design was made double-ended, so it was no longer necessary to turn a court card round to see it clearly. But this also meant that aspects of the designs which made sense when the figures had arms and legs often lost all meaning, e.g. the king of club's orb now unsupported by his hand and suspended in mid-air. The suit sign moved to be always top left and bottom right on the courts. As a result some court cards were 'turned' to face the other way. This happened to the queen and jack of clubs, the queen and jack of diamonds, the jack of hearts and the queen of spades. Players had found it tiresome that 6 courts had their suit-signs on the right, which was inconvenient when cards were held in a fan. 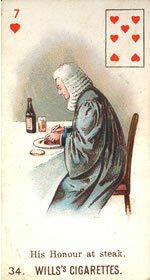 Some makers, however, persisted in their use of unturned courts. Indices were added to the top left and bottom right corners. This also allowed the suit sign to be visible when the cards were held in a fan; a necessary innovation since so many popular games of the time (such as Whist) required the player to hold 13 cards in their hand at one time. The first attempt to place an index on each card was via the device of putting a miniature card in the left hand corner, which had the undesirable effect of obscuring the suit-sign. Later a letter index was added. Later still, a suit sign was added to the letter index and the miniature card abandoned. The design was redrawn to make it neater but keep the same style. Any attempts at realism were abandoned completely.